Morgantown's PRT, or as some would like to call it, GRT, for "group rapid transit." Photo by Sean Marshall. Morgantown, West Virginia, home of West Virginia University (WVU), is a metropolitan area of a bit more than 110,000 residents (add an additional 30,000 to account for the student population.) It’s hilly, lush and deep in Appalachia, nestled among forested swaths of land and along the Monongahela River. The state is not necessarily associated with innovation, urbanization and green technology. But the small city is actually the site of the only operational PRT project in the United States. It began as a demonstration project funded by former U.S. President Richard Nixon as a means of ushering in his support of mass transit. He signed the Federal Highway Act in 1973, allowing nonessential highways in urban areas to be substituted for mass transit, and passed the Urban Mass Transportation Assistance Act 0f 1970. Despite Nixon’s relatively green agenda, PRT is a controversial infrastructure project. At TheCityFix we’ve written about Google’s support of PRT, in the form of a grant to Shweeb, a New Zealand company behind a technology that allows people to travel in pedal-powered pods along an elevated cycle track. But, as we said before, this funding might be better used in support of low-cost transit efforts that provide greater impact while improving the fabric of cities. 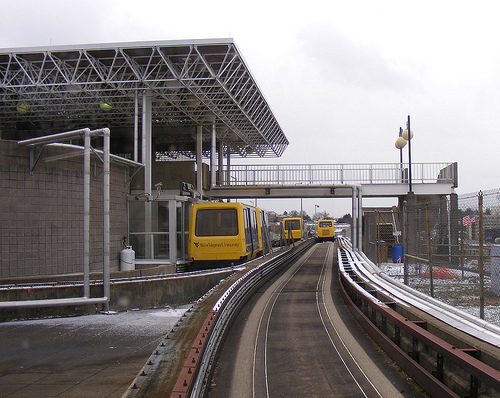 The New York Times in 2007 wrote of West Virginia University’s (WVU) system: the “city’s white elephant now looks like a transit workhorse.” Built in 1975, the PRT system is open from early in the morning until 10:00 p.m. at night during the school year and stops at five campus stations. Powered by electric motors, the computer-driven cars, on a good day, arrive at stations within five minutes of payment or the swipe of an ID card. The system was designed to link two WVU campuses that sit two miles apart. University students can ride as often as they wish after paying the fee of $63 per semester, which funds 60 percent of the system’s $3 million annual operating costs, according to The New York Times. Around 15,000 people ride the service each day. Riders can push a button and select which of the five stops they want on the system’s 3.6-mile route; it is like a horizontal elevator that can go 30 miles per hour. The driverless, 21-passenger fiberglass cars, gliding on rubber wheels and powered by electric motors, pick up riders and deliver them to their stops quickly, bypassing intermediate stations along the concrete and steel guide way. It is this individualized destination option that sets it apart from other cities’ systems. The operators of this system call it the Morgantown PRT. Others do not think it is a “true” PRT since the vehicles and guideway are so large and not all of the rides are non-stop from the origin to the destination. For these reasons, we prefer to call it a Group Rapid Transit (GRT) system. Certainly, it is as close to a “true” PRT as has been achieved in the U.S. to date. For more information, Cities21, a research and advocacy group, explains the designations for PRT and GRT and lists project examples. Speaking of other firsts, Cabinentaxi was the first conceived PRT project in the 1970s in Hagen, Germany, but it never became operational and is now entirely defunct. The video is wonderful for many reasons (notice the music! ), but also pay attention to the video’s before-its-time use of urban planning and public transit buzz words, like “demand-oriented, low-cost urban transportation,” which we still use today.